The Savage Detectives follows two poets, Arturo Belano (Roberto Bolaño’s alter-ego) and Ulises Lima (based on Bolaño’s good friend Mario Santiago), as they try to track down a missing poet named Cesárea Tinajero, as well as their subsequent wanderings through Europe as they grow into adulthood. Written by Roberto Bolaño – the enfant terrible of post-‘Boom’ Latin American literature – it is structured in three, non-linear sections. The first (entitled ‘Mexicans Lost in Mexico —1975’) and third (‘The Sonora Desert — 1976’) are both narrated in a first-person diary format by an aspiring poet named Juan García Madero. Madero has joined a group of poets lead by Belano and Lima that is known as the ‘Visceral Realists’ in the bohemian Mexico City of 1975-6. 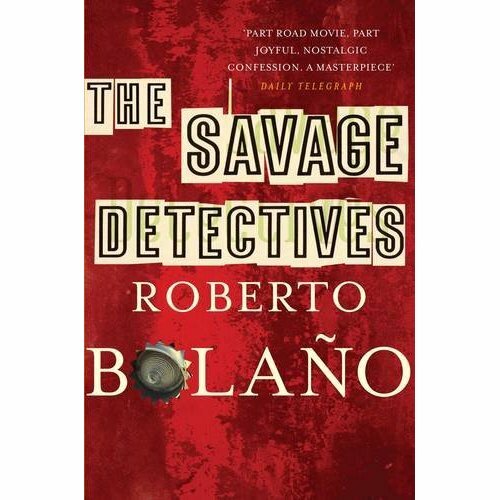 The Savage Detectives is quite autobiographical: Bolaño himself started a movement in 1976 in Mexico called the ‘infra-realists’. When Belano and Lima go travelling to Europe, we are travelling in the footsteps of Bolaño himself who lived in Barcelona, and settled in a small Spanish town on the Costa Brava after marrying. But who are the visceral realists really? For all the posturing about getting published, Lima and Belano never seem to have had anything of theirs put in print. Will they ever amount to anything? And what becomes of their search for Tinajero (and related attempt to outrun a pimp and corrupt cop who are chasing after them)? The middle section is by far the longest at some 400 pages. It’s entitled ‘The Savage Detectives’ and comprises small to long ‘snapshots’, narrated in first-person interviews by some 52 separate characters, all of whom came into contact with Ulises Lima and Arturo Belano, whether from their time in Mexico or in Europe. Many of these narrators are fellow writers, some are lovers, friends, enemies. The anecdotes span twenty years, from 1976 to 1996, and provide us with an impression of who these two drifter poets were and what became of them. But it is only ever an impression, for both Lima and Belano are like ghosts. They came in and out of focus, literally disappearing and reappearing, while many of the narrators can only give oblique impressions or hazy recollections of their interactions with the men, be they short-lived or more meaningful. The change in structure and narration is quite a jolt and for the first 50 pages or so I was wondering what was going on. As we progress in a more or less chronological fashion (with short time hops here and there), the effect becomes clear and there is a gradual darkening in the stories being told. There is a real menace to the final pages, with characters we met in Mexico City dying or being killed or just disappearing. In the afterword, Natasha Wimmer talks about how Bolaño thought of The Savage Detectives as his ‘own answer to Huckleberry Finn.’ Both novels are about friendship and the loss of innocence. But where we follow Huck Finn on his journey first hand, here everything is cloaked through the lens of all these other narrators, something which adds to the sense of unease. This sense of absence reflects one of Bolaño’s motifs. Bolaño was a Chilean in exile, but as Wimmer points out, he was never comfortable with Chile or Chileans in general. He is quoted as saying his home was the Spanish language. The sense of increasing despair is also reflected in the poetry of the missing Tinajero. Like the poet, much of her work has been lost. The one poem they find is actually three pictures. In each picture there is a square placed on a line. The first line is flat, like a becalmed sea. In the second picture the line is wavy, and in the third the line is like a jagged mountain range. It looks like a little boat without its sails tossed on stormy seas. That, it seems, is life’s progression: from calm through unease to outright storms. One of the earlier ‘stories’ in the middle section is narrated by Auxilio Lacouture and forms the basis of Bolaño’s novella Amulet (see my review) which was published two years after Detectives. This is another feature of Bolaño’s oeuvre: the way characters from one work pitch up in another (like David Mitchell), and also the way stories themselves overlap. Auxilio tells the story of how the military overran the University of Mexico in 1968: a metaphor for the real-life massacre of Tlatelolco. The hallucinatory nature of the middle section is also true of the book-ends narrated by Madero as he describes how he is sucked into Belano and Lima’s strange quest to find Tinajero alongside a prostitute named Lupe, and chased by Lupe’s pimp and a corrupt Mexican cop. We get arm-length views of Belano and Lima, and though we get close at times, we then find ourselves shunted away again. Of course, about Bolaño we know an awful lot. A combative personality, he eschewed the great and celebrated Latin American ‘Boom’ authors, many of which are seen differently at home than in the English-speaking world. Take for instance Garcia Marquez’s very close relationship with Fidel Castro. Bolaño dismissed Marquez as “a man thrilled to have known so many presidents and archbishops; Mario Vargas Llosa: same thing, but more polished.”(!) Bolaño’s views are coloured by his personal experience: he got caught up in the Pinochet overthrow of the Allende government in Chile on a return visit, and was briefly jailed. The revolutionary Mexican PRI party was responsible for the Tlatelolco massacre. Bolaño and his infra-realist buddies went to the readings of other Mexican poets to disrupt them because they took money from the PRI. One of his authorial predecessors he had time for was Borges, which is hardly a surprise, for Bolaño’s writing is in many ways as mysterious as Borges’ Labyrinths. Bolaño is not of the Boom, but he gives us all another way to view the same madnesses that plagued Latin America in the 20th Century and still do so today albeit to a lesser extent. But he extends the rage to include more modern illnesses, such as the all-powerful drug cartels that seem to run most of Mexico. He recasts what it means to be a Latin American writer. The Savage Detectives is one of two of Bolaño’s on the ‘1,001 Books to Read Before You Die’ list, (along with 2666), though many including James Wood and Natasha Wimmer point to his other novel By Night in Chile to be even better. I for one am looking forward to reading it. What could be a more beguiling place to start my ‘musings’ than a pondering of Roberto Bolaňo’s Amulet, a short book of only 184 pages or so, yet one that is by no means a light or flimsy work. Far from it. It is a distilled essence that resonates strongly. It is not a humorous work like his The Savage Detectives, yet it is a wonderful read all the same. “The strength and originality of his vision lies in the devastating scepticism which he brought not only to magical realist methods but to the very springs of fiction itself. His work is the crossroads where Márquez meets Burroughs and Borges meets Mailer, resulting in a riotous dust-up.” As Bolaňo was quoting as thinking that magical realism “stinks” and preferring the work of Borges, Banville’s summation seems well made. but there was no one there to come to our aid. This is going to be a horror story. A story of murder, detection and horror. But it won’t appear to be, for the simple reason that I am the teller. Told by me, it won’t seem like that. Although, in fact, it’s the story of a terrible crime. We are immediately placed into the confines of this oblique, melancholic and hallucinatory ‘horror’ story. The ‘horror’ is the invasion of the university by the army and in 1968, the rounding up of all its personnel, and the Tlatelolco massacre, a government massacre of student and civilian protestors in the Tlatelolco district of the city on October 2, 1968. (The official death toll was 30, though many accounts point to a likely 200-300 deaths). But we are not witness to this. Rather, Auxilio skirts around this obliquely; she tells us of how she found herself in a nook of safety in the stalls in the female bathroom on the fourth floor of the Literature and Philosophy faculty of the university when it is stormed by the army. She glimpses her friends and university personnel being hoarded into trucks and taken away to God knows where. She chooses to resist, and stays in the bathroom for twelve days. As noted above, Auxilio’s meetings with Belaňo also tell the tale of his transformation. This gives us a Bolaňo himself obliquely placed into the structure and horror of the story, and allows Auxilio to describe the change in him after he spends time in Chile before returning to Mexico City. Here the poets all see the change that comes from knowing death, and both Belaňo and Auxilio are called on to save a man they find while trying to help a friend. The scenes of horror and angst that churn the surface of Auxilio’s hallucinatory visions accumulate to create the ghost-song of the generation of young Latin Americans lost in “sacrifice”. It is a song that reverberates in Auxilio’s ears, a song of “courage and mirrors, desire and pleasure.” This seems at first read an odd note on which to draw the final pages together given the trauma of these disappearing youth. Yet it is redolent of the defiance of the young and their passion for life and each other, the defiance that Auxilio shows together with her frailty, the defiance that should always speak and sing louder than violence ever can. I found this book to be a wonderful and evocative picture, an oblique look at horror, yet one that resonates with a real truth because of this very obliqueness – for our ability to rationalise such events is limited. Indeed, we simply can’t; we instead tread warily around its edges lest we become dragged into the heart of its maelstrom. And at our most pressured, we fuse a massacre with a march, and a song of lament becomes an amulet we carry to remind ourselves of what it means to live. … And just as this unforgettable song becomes the amulet in Bolaňo’s final – and I think – wonderful line, I hope that my thoughts become, in some small way, an amulet for my own nascent journey through the vivid worlds of all our writers’ genius – a song and life of courage and mirrors, desire and pleasure. Amulet is a wonderful book, and an excellent (and short) introduction to Bolano’s longer works. I’m looking forward to The Savage Detectives and 2666! For more on Bolaňo’s life and work, read the excellent piece written by Daniel Zalewski in The New Yorker. For more on Amulet: see: Banville’s Guardian review. And for a really erudite review, see Eli Evans’ review on bookslut.